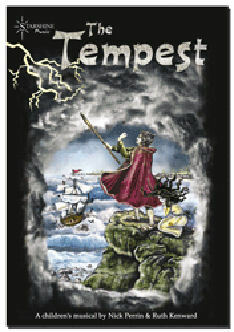 The Children's Theatre 2011 success was The Tempest. Writtenby Nick Perrin and directed by Alison Horne, this was a musical version of Shakespeare’s play, written in contemporary English for children. It had a variety of great characters including a repellent monster, magician, the spirit of the island, a drunken butler, sailors, sprites and hobgoblins. As well as a number of principal roles there were plenty of opportunities for the chorus to show their talents in singing, acting and dancing. Prospero is a magician. He and his daughter Miranda have been marooned on a desert island for twelve years, after Prospero’s brother Antonio betrayed him. Now, Prospero is looking for justice. He uses his magical power to cause a tempest, bringing a passing ship onto the rocks. Antonio is among the survivors washed up on the shore, along with several others who plotted against Prospero. We learn of two new murder plots, one of which involved the island monster Caliban, a drunken sailor and a jester. We watch as Miranda sees another human being (Ferdinand) for the first time since she was three. Miranda is horrified that - in raising the storm - her father has caused Ferdinand huge suffering. Eventually all are set free from the past by Prospero’s forgiveness. "Well done to everyone in the cast of "The Tempest" you were all great"
"Well done to all the children who performed fabulously tonight in The Tempest! I am so proud to be part of such a fantastic group". "The Tempest - Absolutely Fantastic! - Well Done To Everyone Involved!"